Seriously speaking I do not remember when we met for the first time; as far as my memory recollects, it was in those hectic office hours of Hindustan Times when she used to come and share about her saree business. One of my earlier purchases was out of obligation I guess. But eventually my liking and taste got dissolved with her creations. An elderly person, carrying a bag and coming to office for business was something I felt quite out of the way at that time. She was not working out of compulsion, but to live her dream to create something of her own. Her perseverance and sheer willingness moved me. I started visiting her place and found a treasure of creativity, unfolding…from her I also started knowing and understanding texture, quality, and fall of the sarees…. Over the years, our relationship took a different path. The buyer-seller concept got changed into a much cosy, homely affair.At times even if I have not picked up a saree, I was not allowed to step out without lunch/dinner. 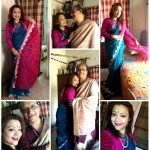 Sapna aunty masters in abstract designs in cotton,tussar silk. The saree is packed with neat kantha works – a mix of button stitch and Gujrati stitch with mirror work. Especially for this saree a full sleeve designer blouse was made to give that perfect look. Last evening, sapna aunty wore one of her beautiful brown silk-designed sarees that has stripes of kantha work stitched as appliqué. Her kantha blouse is a signature style which she carries wonderfully! Uncle was the obvious photographer, who was super excited for this sareepact story shoot! 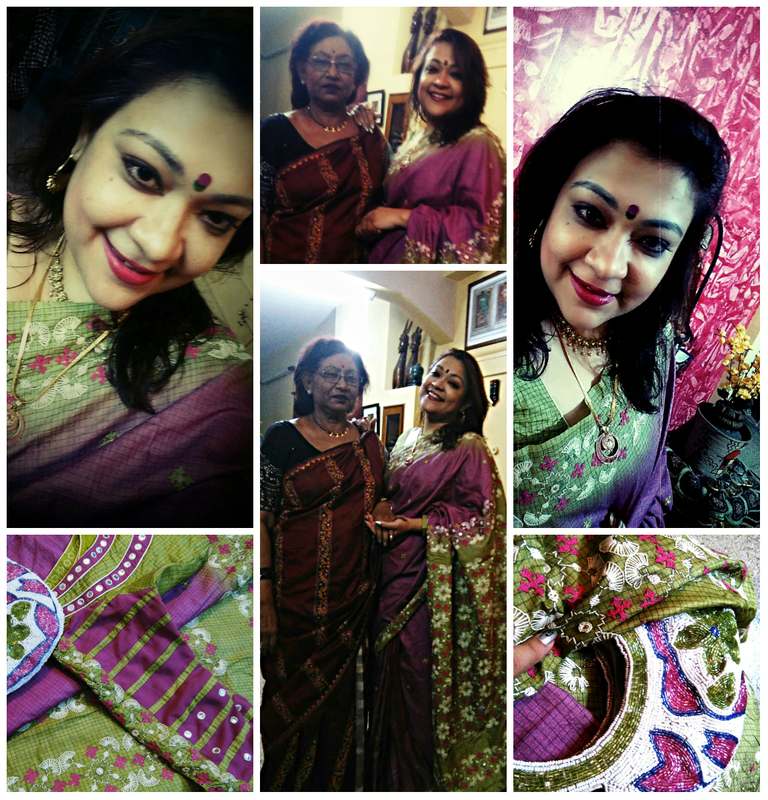 Thank you Sapna aunty for your love, warmth and most importantly all those unique sarees, on the basis of which I got that root to start this saree pact challenge!